- The EcoRest is a 8 inch fill futon mattress that is designed to work on Bi-Fold futon frames. It is suitable for use as a sofa and for occasional sleeping. Not recommended for every night sleeping. - Wolf has been in business since just after the Civil War. Wolf began their four generation business in 1873...that's over 140 years in the mattress business! - Wolf Corporation has its own fiber division which means that it is vertically integrated. In fact they actually sell cotton fiber fill to other companies in the futon business. - Wolf's Full Border Shell is a 3-D sewing design of 6.5 oz. PolyCotton Duck fabric and a finished zippered closure for all WOLF covers which provide for a more tailored and finished look.  Works on Bi-Fold futon frames.  8 inches of total fill materials inside.  Outer layer of natural cotton batting.  Durable 6.5 oz. polycotton duck casing. 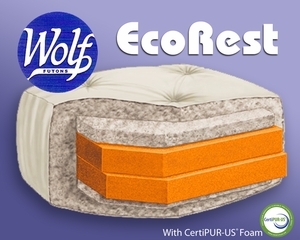 Wolf futon mattresses are made to order and drop-shipped directly from the manufacturer in 2-3 days. 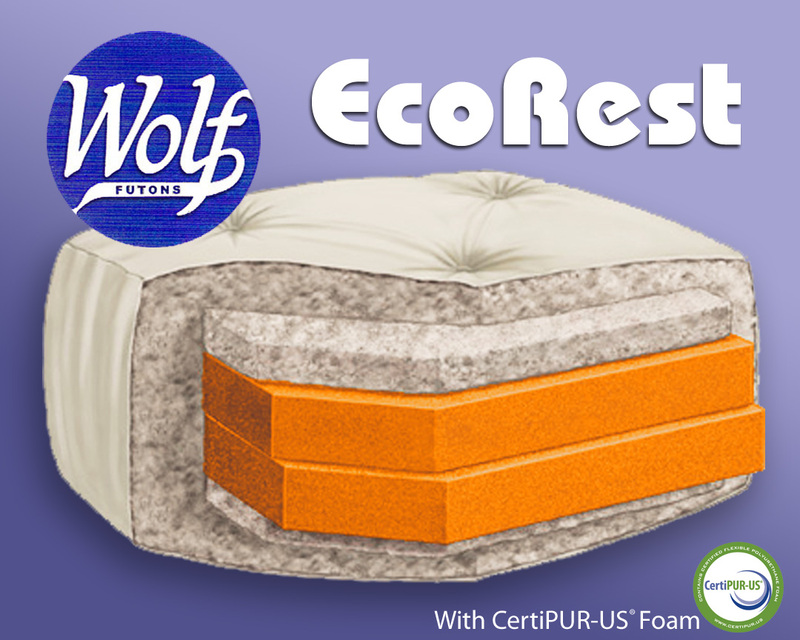 The Wolf EcoRest futon mattress comes with a 5 year manufacturer's warranty against defects in materials and workmanship.